You have some offers that you wish to show inside a popup and need to include a button for redirection, for showing a coupon code or something else? Create the popup with a content you wish and add a button element with a bunch of customization options - all to your needs! Let&apos;s check all the options for customization! Button Behavior - Select your popup behavior after the button is clicked. Redirect Url - Add the URL of the page/site you want your users to be redirected to, when clicked on the button. Copy To Clipboard - If this option is checked, a copyable text will be shown after the user clicks on the button. Add any text you wish here, for example a coupon code, that the visitor can use after submitting the button. Close Popup - If this option is checked, the popup will close after someone clicks on the button. 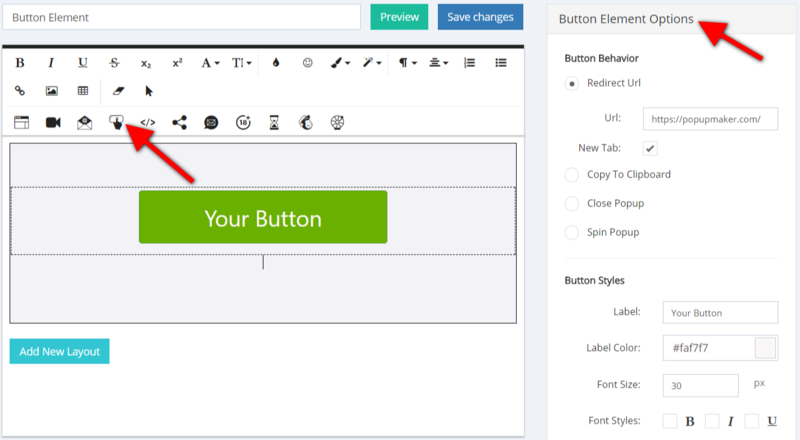 Button Styles - Customize the look of the button. Label - Enter the text for your button. Label Color - Pick a color for your button Label. Font Size - Select the Font Size of the label of the button. Font Styles - Make the label Bold, Italic or Underlined. Width - Set the Width of the button, in percentages. Height - Set the Height of the button, in pixels. Color - Change the Color of your button, pick any color you wish! Border Size - Customize the Border Size of the button, in pixels. Border Radius - Change the Radius of the Borders of your button, in pixels. Border Color - Change the Border Color of the button if you wish. Padding - Add some Padding pixels to highlight the button. Margin - Add some Margin pixels to highlight the button. Button Hovering - Select colors that will be shown when someone hovers over the button. Color - Select the color of the button when hovered over it. Label Color - Pick a color for the label, that will be shown when hovered over it. Border Color - Pick a color for the borders to show on hover.